The United States and Canada have had conflict over the interpretation and demarcation of the exact boundary dividing the U.S. and Canada. This case discusses some underlying reasons why the U.S.-Canada Border, the longest undefended border in the world, has been and is a point of contention between the U.S. and Canada. In particular, this case will focus on the Alaska Border Dispute in the early 1900s. Some people might question the importance of delineating a precise border dividing the two allied nations, particularly the 2,379 miles which runs under the water and is physically invisible. Yet, it has taken five treaties over a period of 120 years, from 1783 to 1903, to define the division of land and water between the two nations. Even today more accurate mapping is being considered using satellite technology to further define the boundary. Following several temporary boundary agreements in the 1800s, the boundary was largely determined by 1903. However, it was not until 1908 that a formal treaty was signed by the United States and Great Britain (Canada was a colony of Great Britain at that time). This treaty created a joint International Boundary Commission to mark the 5,525 mile long border, roughly the distance from Seattle to Shanghai. In order to meet treaty requirements of keeping a well-marked border, the United States and Great Britain found it necessary to make amendments. In 1925, a new Treaty was signed agreeing to maintain a visible border and making the International Boundary Commission (IBC) a permanent agency responsible for the upkeep of the border and to help resolve disputes along the border as they arise. Furthermore, the 1925 Treaty stipulates that the Commission is legally required to clear brush and trees, regardless of the impact on wildlife and the landscape, keeping a 10-foot-wide boundary on each side. Today the commission maintains approximately 9,000 visible land markers made of granite, concrete or steel and lighted buoys that float in the water, dividing jurisdictions over such rights as one's fishing domain. The Alaska boundary dispute, between the United States and Canada, occurred in the early 1900s. It was a controversial issue that seriously jeopardized Canadian-American relations. The dispute initially began when the United States purchased Russian America, which is today known as Alaska, from Russia in 1867. According to the Anglo-Russian treaty of 1825, the 141st Meridian constituted the boundary line between Canada and Russia. Unfortunately, in 1825 much of the area surrounding the 141st Meridian was largely unknown territory that had not been surveyed, making the boundary line uncertain. As a result, the U.S. demarcated Alaska based upon what Russian maps indicated to be Alaska. Canadians, however, professed that Russian maps showed more land belonging to them than stipulated by the treaty of 1825. Hence, conflict between the United States and Canada in the Alaska border dispute evolved from an agreement made by Russia and Great Britain which established an ambiguous definition of where the Alaska-Northwest Canada Border lay. According to the Anglo-Russian Convention of 1825, if there was not a well-marked range of mountains in existence along the 141st Meridian, the boundary was to be drawn parallel to the coast. Canada contended that the coast meant a line drawn along the ocean shoreline, forming a disjointed boundary which would allow Canada access to a harbor from the sea. The United States, on the contrary, avowed that the coast meant a line joining the bays on the continent itself, making a continuous land boundary which would require Canada to cross American territory before reaching the sea. Consequently, the whole boundary was in dispute. In 1892 the U.S. and Canada agreed to a joint Canadian-American team to survey the disputed area. However, the survey only established that there was no well-marked range of mountains in existence. It did not settle where the Alaska boundary lay. Vitus Bering, a Danish explorer commissioned by Peter the Great to lead Russian sailors on a voyage from Siberia, first sighted Russian-America's (Alaska) mainland in 1741 (see Bering Case). Russia quickly established Russian sovereignty in the New World, exploiting Bering sea fur and mineral resources. Russian whalers and fur traders established the first settlement on Kodiak Island in 1784. In the 1820's when the fur trade began to decline, the Russians began to lose interest in Russian-America and offered it to the United States. The United States was interested, particularly in furs, whales and trade. Moreover, the U.S. saw the Russian-America connection as an important link to Asia and believed that it could provide a land bridge for an around-the-world telegraph line. United States Secretary of State, William H. Seward, offered Russia $7,200,000, or two cents per acre, for Russian-America. On October 18, 1867, after the United States Senate ratified the treaty by only a single vote, Russian-America officially became the property of the U.S. and was renamed Alaska. Meanwhile on July 1, 1867, the three eastern political units of Nova Scotia, New Brunswick, and the Province of Canada formed one jurisdiction under the name of Canada, making it one continental nation. Many Americans coined the purchase of Alaskan territory as "Seward's Folly" or "Seward's Icebox." However, when Joe Juneau discovered gold in the 1880's and thousands of people began flocking to Alaska, Americans began to consider a "Seward's Folly" as a valuable possession. Although it was a perilous trip in sub-arctic weather, a mass movement of miners and prospectors stampeded to the Klondike gold fields of Alaska and Canada in hopes of discovering gold. One hundred thousand fortune seekers were said to have headed to the Klondike, but less than 30,000 were said to have actually made it. Nevertheless, the Klondike gold rush had a significant impact on the relations between the U.S. and Canada, specifically the Alaska-Western Canada border. By increasing the population of the area, the number of people concerned with the Alaska Border Dispute effectively increased. In Canada, anti-Americanism intensified and was a strong force, owing mostly to disputes over the Alaska boundary, access to the Yukon, Bering Sea Sealing and North Atlantic fisheries. By 1898, the gold rush made Alaska, particularly a narrow strip of territory jutting down from the main part of Alaska known as the Panhandle, a matter of vital importance. Initially, Canadians reveled over the world-wide attention their country was receiving from the gold rush, but rapidly realized that it was the Americans who were managing to get most of the gold. The U.S. occupation of the Alaska Panhandle, which fenced in the gold-bearing territory of Canada from the sea, made it easy for Americans to deny Canadians entry into their own territory. Declaring that it was difficult to exercise control over the ruthless miners who traveled to the Klondike in search of gold, the U.S. administration, under President McKinley, did not attempt to restrict or contain American prospectors in search of gold. On the other hand, Canada accused the U.S. administration of not deterring the miners and prospectors from entering Canadian territory because it was in the interest of America to prevent Canadians from enjoying economic advantages over Americans in the Yukon. Certainly, many people from the U.S. and Canada made spectacular fortunes during the Yukon gold rush period. The total value of the gold mined in the Yukon was nearly $2,500,000 in 1897 and $22,275,000 in 1900. But, one must note that the gold rush era caused many Yukon Native people, known as Inuvialuit in the western Arctic and Inuit in the eastern Arctic, to experience social, economic and political upheaval. The Yukon Native people are believed to have been the first people in the Yukon, crossing the Bering Strait more than 10,000 years ago when it was still a land bridge between Asia and Alaska. Today, there are eight aboriginal languages used in the Yukon territory (see map below) and the settlement of land claims remains an important issue to the Yukon Native peoples. Unfortunately, issues regarding the Yukon Natives are often dismissed by the U.S. and Canadian federal governments. In response, the first Inuit Circumpolar Conference was held in 1977 with Inuit representatives attending from Alaska, Canada and Denmark (Greenland). The Inuit people called upon the U.S. and Canadian governments to establish Inuit health care, education and cultural exchange programs. In 1898, a Convention was drawn up by the Joint High Commission to survey and mark the 141st Meridian for the purpose of determining the exact limits of the territory ceded to the United States by the Treaty between the U.S. and Russia in 1867. The Convention, however, failed to be ratified by the United States Senate and the question of marking the boundary remained unresolved for several years. Finally, in January of 1903, the U.S. and Britain (Canada was a colony of Great Britain at that time) agreed to address the boundary dispute formally. It was decided that each side would appoint three impartial judges to listen to both nation's case and make a decision. Theodore Roosevelt appointed Elihu Root, Secretary of War; Henry Cabot Lodge, Senator from Massachusetts; and George Turner, Ex-Senator from Washington. On the opposite side, Great Britain appointed Baron Alverstone, the Lord Chief Justice of England; Sir Louis A. Jette, Lieutenant Governor of the Province of Quebec; and Allen B. Aylesworth, from Toronto. Canada believed that they would receive British support since they supported the British in the Boer War. Nonetheless, the British voted in favor of the United States and a formal treaty was signed in 1908 between the United States and Great Britain setting up the International Boundary Commission to mark the boundary officially. Later, in 1925 the treaty was amended. It created a permanent International Boundary Commission to keep an accurately located and visible border. The markers are shaped like the Washington Monument and are suppose to be placed within sight of one another. Based on past treaties, Canadian and U.S. law requires that the border be visible. Hence, its entire length is cleared every few years regardless if it passes across marshes, through forests, under rivers, or over the tops of mountains. For instance, in 1932, the Waterton-Glacier International Peace Park was created between the U.S. state of Montana and Alberta, Canada, representing international peace and goodwill between the United States and Canada. The Waterton-Glacier International Peace Park, the first peace park to be established in the world, is one of the world's largest and most undamaged eco-systems in North America. Today, there is dissension over the 1925 treaty requirement of keeping a 20-foot wide demarcated line in the peace park since it requires clear-cutting. Many environmentalists argue that the clear-cut regulation threatens the biological diversity of plant and animal life in the area. Additionally, it is questionable whether cutting timber to demarcate a line through the Waterton-Glacier International Peace Park, recognized as a World Heritage in 1995, represents division or unity. The well-defined border in this case is a contradiction to a park representing the harmonious and peaceful resolution of two nations. Disagreement ensues between the U.S. and Canada over such land and water division as the southern border between the Alaska Panhandle and British Columbia and in the Arctic Ocean off the Alaska-Northwest Canada border, known as the Northwest Passage. On January 3, 1959, Alaska officially became the 49th state of the United States and is home to the highest mountains, the largest land mass, the youngest population, and the greatest number of bald eagles in the United States. Alaska, which derives its name from the Aleut word Alashka meaning "Great Land," is twice the size of Texas with a coastline that stretches over 47,000 miles. Today, Alaska is prized not only for its vast supply of natural resources, but also for its natural beauty. The Waterton-Glacier International Peace Park is one of the world's largest and most undamaged eco-systems in North America. The park, which lies between the U.S. state of Montana and Alberta, Canada, contains sediments dating back to more than one billion years ago. In addition, the peace park is home to hundreds of diverse animal and plant life. 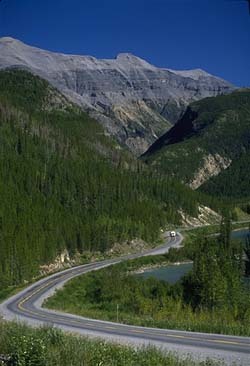 Therefore, in hopes of maintaining the ecosystem and minimizing negative impacts on wildlife in the area, officials from Waterton-Glacier International Peace Park made a formal request to the International Boundary Commission to waive the clear-cut regulation and suspend the cutting of timber to demarcate a line. The commission, which oversees the boundary, rejected the officials appeals, stating that it could not disregard a treaty passed by Congress and Parliament to maintain a 20-foot wide visible line. Controversy continues over the clear-cut regulation in the peace park, particularly since many environmentalists argue that herbicides sprayed to mark the boundary kill trees. For instance, in 1955 and in 1967, agent orange was sprayed from helicopters and killed trees up to 50 feet away from the boundary. Although the Alaska Boundary dividing the U.S. and Canada was established in the early 1900s, the American and Canadian governments continue to be shaped by boundary and sovereignty questions, particularly questions revolving around Native American peoples' land claims and the Arctic Policy. In 1971, President Nixon signed the Alaska Native Claims Settlement Act. This act gave Alaska Natives, residing in U.S. territory, title to 40 million acres of land and paid them $962.5 million to stop any further aboriginal claims to lands in Alaska. In 1984, the Eskimos of the western Arctic signed a land claims agreement with Ottawa in Canada, giving the Canadian government control over 35,000 square miles of land. In return, Ottawa paid the Eskimos CAN$170 million (US$149 million) in financial compensation. Today, at issue is whether the historic arctic waterway, or Northwest Passage, is owned by Canada as Ottawa claims or is an international strait open to all nations, as the United States government insists. During the Reagan administration, the U.S. agreed to ask permission from the Canadian government before sending ships or submarines through the northwest passage. In return, Ottawa agreed that permission would be routinely granted. Bach, Thomas Willing. The Alaska Frontier. Philadelphia, PA: Press of Allen, Lane and Scott, 1902. Penlington, Norman. Canada and Imperialism. Toronto, Canada: University of Toronto Press, 1965. Department of State Dispatch. The Artic and U.S. Foreign Policy, 1970-90.U.S. Department of State (8 April 1991). Webb, Melody. The Last Frontier.Albuquerque, NM: University of New Mexico Press, 1985. Wharton, David. The Alaska Gold Rush. Bloomington and London: Indiana University Press, 1972.